Finding a job can be hard—and keeping one can be even harder. But picking a job in the restaurant industry? Well, it looks like you made the right choice. 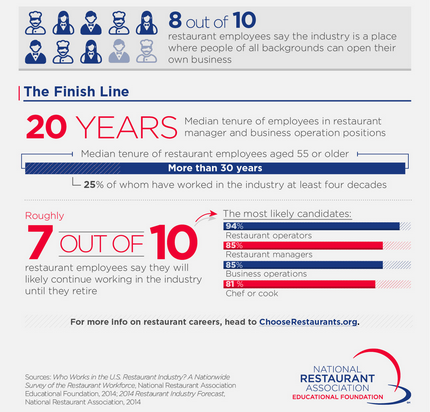 As this infographic from The National Restaurant Association Educational Foundation explains, there’s never been a better time to be a part of the restaurant industry. For those savvy businesspeople who are looking to own their own businesses, restaurants can be the way to go. 42% of restaurant owners say they started their business from scratch, and 8 out of 10 restaurant employees agree that people from all backgrounds can open their own businesses in the restaurant industry. Even for employees who are just starting out, restaurants are the way to go. More than 9 out of 10 restaurant employees agree that whether you’re a busser or a server, the restaurant industry is a great place to get a first job, and almost 9 out of 10 restaurant workers say that the restaurant industry is a great place to be if you want to succeed based on hard work. 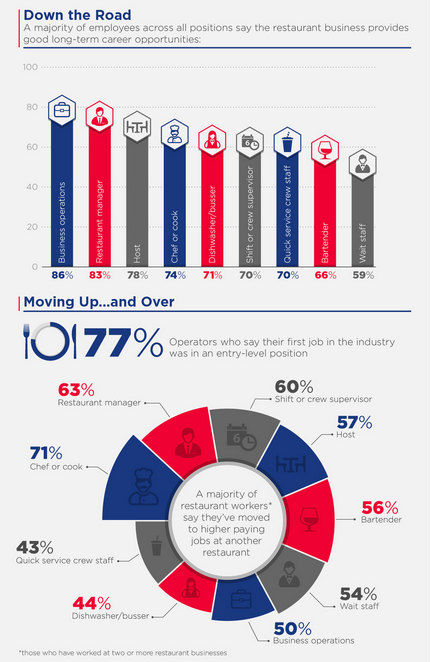 In fact, 77% of operators say that their first job was in an entry-level position, making the restaurant industry a field in which movin’ on up is encouraged! And when the future comes to mind, the majority of employers say that the restaurant industry provides good long-term employment opportunities. In fact, the median tenure of restaurant employees over 55 years old is more than 30 years! And 25% of those employees have over four decades of experience. About 7 out of 10 restaurant employees plan to keep working in restaurants until they retire—that’s dedication! No matter what your position is, it’s plain to see that a job in the restaurant industry just makes sense. 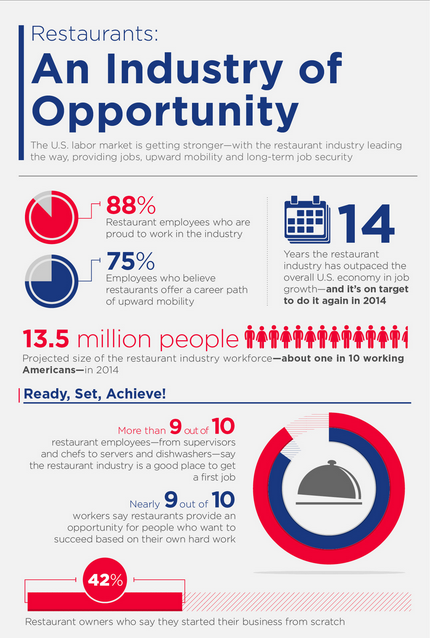 With tons of opportunity, both now and to come, restaurant jobs have a bright future.